The ideas behind intentional creativity have been alive since the first humans created art in honor of the land, deity and their hopes for things like a good crop, acknowledging the moon cycles, thanks for the harvest. Early peoples created their thoughts, prayers, wishes, needs into creations of their hands. This was taken to another level through making art as part of a spiritual practice, and as tools of usefulness and eventually beauty and adornment. Over 50,000 years of images of the feminine show this lineage in form of a people’s relationship with their understanding of the Divine. Creations, more than any medium show us the thoughts, practices and rituals of our ancestors. Art is the history of our ancestors that tells us who we were, how we developed and who we are becoming. We consider ourselves, as a global community of creatives, part of this unfolding human story. The specific lineage that we claim begins in the 1930’s with the sculptor, printmaker, writer Lenore Thomas Straus. Lenore was invited by the Roosevelt Foundation during the New Deal to create art. Given that they allowed artists to choose what they created, she chose to image, in stone, the Preamble to the Constitution, and take ideas like: “a more perfect Union, establish Justice, insure domestic Tranquility, provide for the common defense, promote the general Welfare, and secure the Blessings of Liberty to ourselves and our Posterity” and turn it into image. These images exist in Greenbelt. Lenore Thomas Straus met Sue Sellars, a young artist in Maryland in 1952, and agreed to mentor her and became her legal guardian. After a few years of instruction under Straus and her community of artists in Accokeek Maryland, Sue was took a job in San Francisco at Stanford University for the George Vanderbilt Foundation, as the head biological illustrator. Lenore taught Sue in clay, paint, drawing, printmaking, stone carving and perhaps most of all – in inquiry. A kind thinking about art making. You will find in Lenore’s work, as well as in Sue’s work, images with text, asking questions poetically on the page as if the drawing itself is solving a problem. This is the thinking that inspired an entire movement which now serves thousands of women and month through art education. 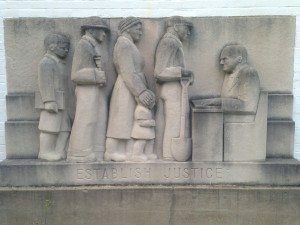 There is much more to to say about this story and how it evolved, but that is a story for another day, our hope on this page was to give you an idea of where this lineage came from and why. In the 60ies Sue met Caron McCloud and Janet Seaforth and became a part of a family of women that would last the rest of her life. Caron’s daughter, Shiloh Sophia would study with Sue from the time she was born – and Sue passed the lineage of what Lenore gave her, onto Shiloh and her cousin Bridget, who passed it onto their students. This library of art education is dedicated to the lineage that made this kind of work possible. 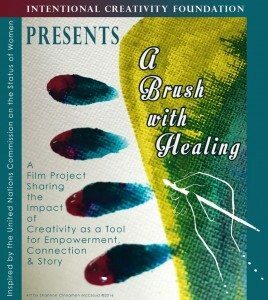 Our hope is to provide free and affordable education to women and girls, our first project, A Brush with Healing was unveiled at the UNCSW Commission on that Status of Women 2016. The featured teachers for the time being are amazing intuitive artists like Flora Bowley, Chris Zydel, Rachel Bavis, Pixie Lighthorse, Laura Hollick and Shiloh Sophia. The library will continue to grow and shift as more intuitive artists and Intentional Creativity Teachers bring their classes into form. Our hope is the classes will be great for beginners, as well as those already developed and can be used to teach others around the world.